Imagine having Martha Stewart at your side in the kitchen, teaching you how to hold a chef's knife, select the very best ingredients, truss a chicken, make a perfect pot roast, prepare every vegetable, bake a flawless pie crust, and much more. In Martha Stewart's Cooking School, you get just that: a culinary master class from Martha herself, with lessons for home cooks of all levels. 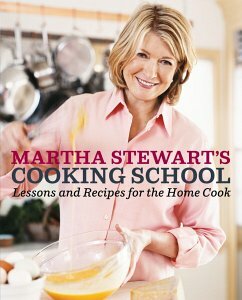 Never before has Martha written a book quite like this one. Arranged by cooking technique, it's aimed at teaching you how to cook, not simply what to cook. Delve in and soon you'll be roasting, broiling, braising, stewing, sautéing, steaming, and poaching with confidence and competence. In addition to the techniques, you'll find more than 200 sumptuous, all-new recipes that put the lessons to work, along with invaluable step-by-step photographs to take the guesswork out of cooking. You'll also gain valuable insight into equipment, ingredients, and every other aspect of the kitchen to round out your culinary education. Featuring more than 500 gorgeous color photographs, Martha Stewart's Cooking School is the new gold standard for everyone who truly wants to know his or her way around the kitchen. This best-selling cookbook originally inspired Martha Stewart's beloved PBS series of the same name and includes some of the recipes the show featured in its first seasons. MARTHA STEWART is the author of dozens of bestselling books on cooking, entertaining, gardening, weddings, and decorating. She is the host of The Martha Stewart Show, the Emmy-winning, daily national syndicated program, and founder of Martha Stewart Living Omnimedia, which publishes several magazines, including Martha Stewart Living; produces Martha Stewart Living Radio, channel 112 on SIRIUS Satellite Radio; and provides a wealth of ideas and information on www.marthastewart.com. SARAH CAREY graduated from the Culinary Institute of America. In 1999, she joined MSLO, where she is food editor of Martha Stewart Living and a regular contributor to Everyday Food magazine. She is also one of the hosts of the PBS television show Everyday Food.